Trek Tours Australia was created in 2010 with a focus on providing high quality, small group trekking experiences in Australia’s most spectacular regions. With many years of experience, Trek Tours Australia has developed a deep understanding of what is required to operate outstanding trekking holidays. The company continues to innovate and promote advanced eco-tourism principles, whilst exploring Australia’s magnificent wilderness. From small beginnings Trek Tours Australia has now grown to employ thirty of the best wilderness guides in Australia – whose experience, knowledge and passion help to create inspiring journeys for our guests. Responsible travel is the very core of our business – it is the heart that keeps it alive. Trek Tours Australia aims to be at the forefront of this movement and will always continue to improve and innovate in our commitment to the principles of sustainable and responsible tourism. Working together with our guests, suppliers, government and indigenous stakeholders – it is our goal to continuously monitor and improve our performance and to ultimately be regarded as one of the best tour operators in Australia. For more details on sustainable bushwalking please visit the Green Guide to Bushwalking. The following are some of the things we are doing in a practical sense to justify and enhance our company’s commitment to the environment, local communities and our guests. By engaging local producers, suppliers and service providers in all the regions we operate, Trek Tours Australia creates strong social and economic ties with the community. We educate and inspire our guests and employees to become more aware, engaged and active in environmental issues. We provide our employees with safe, supportive and inspiring work environments, we encourage and assist them with personal and business development skills. By facilitating a connection with the premier wilderness areas of Australia we establish profound and lasting bonds between our guests and the land. We work collaboratively with National Park authorities and liaise closely with Traditional Owners in all states and territories. Our Volunteer Programs enable us to connect more closely with the trails and regions where we operate. These programs are very popular and continue to deepen our connections with the wilderness areas where we operate. We are privileged to work in some of the worlds’ most pristine wilderness areas and we have a very strong commitment to preserving and protecting these areas. 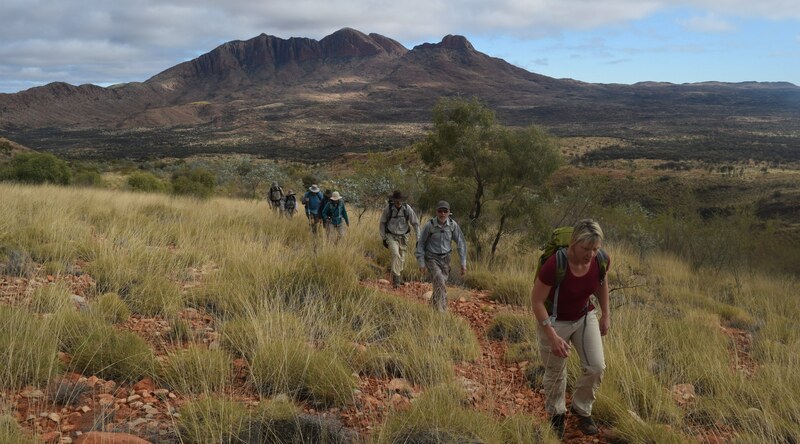 Trek Tours Australia adheres to minimal impact bushwalking principles and a ‘leave no trace’ policy. We participate in a carbon offset program and use 100% FSC (Forest Stewardship Council) paper products. Wherever possible we buy local organically produced products. In our office operations, where possible, we use energy efficient bulbs, turn off lights (and all appliances when we close up shop) when they are not in use, use energy efficient appliances and equipment with a four or five star rating and use natural light wherever possible. We reuse scrap paper and print on both sides when available, rely on email correspondence and ask that people only print if necessary. We continually keep abreast of all environmental issues affecting our industry and our business in particular. We make time each year to volunteer our services in the upkeep and maintenance of walking tracks and trails that our company uses. By keeping our tour group numbers to a maximum of 10 guests we believe we offer a significant advantage to the trekker and the impact on the places we visit. We continuously monitor our practices and procedures to ensure that we leave the lightest footprint we can. Some of the things we do to make sure this happens, is our choice to participate in a carbon offset program, offsetting all our flights through airline carbon offset programs, using accommodation that is not wasteful of local resources or harmful to the environment, and avoiding purchasing disposable goods/ items and trying as much as possible to buy in bulk to avoid excess packaging. Water and its conservation/preservation is a big focus for us; we conserve water in many ways from washing our vehicles with a bucket and sponge, to training/advising our guests to brush their teeth with a cup of water rather than leaving a tap running. Protecting and nurturing natural water sources and courses is vital, and we teach our guests about the importance of maintaining water’s integrity in natural bush settings, for example not swimming in certain areas, positioning of camp toilet facilities and how to treat water for safe use. Decomposting toilets are installed at our semi-permanent campsites, which require no water and provide a smell-free and sanitary toileting system. In most of the areas that we travel camp fires are not permitted, where they are we make sure that we bring our own firewood that has been purchased and /or harvested not from old growth or in wilderness areas, and not from high conservation value trees. We go into wilderness and National Park areas and are required to take out everything we take in, hence recycling is a priority. We have installed solar panels at all of our semi-permanent campsites and on our trailers which power our lights and refrigeration systems. Solar cooking systems are used to heat water and cook food, reducing reliance on wood and gas. Trek Tours Australia donates part proceeds of our annual profits to local community ecological development groups, disaster relief efforts, indigenous education programs, native animal rescue centres, Riding for the Disabled, the Fred Hollows Foundation, Friends of the Larapinta Trail and Beyond Blue. By creating a profitable and environmentally sustainable company Trek Tours Australia will be able to further promote and share true wilderness experiences. We aim to deliver economic benefits and lasting ecological sustainability to the areas and communities that we operate in. We believe in putting back more than we take out, both in an environmental sense and a human sense. We will continue to serve, promote, educate and inspire people of the world to explore the Australian wilderness. Click here for a list of organisations we support. We believe that the best way to really experience Australia’s spectacular wilderness is to walk in it. Unlike travelling in a vehicle, a hiker can take the time to experience the true beauty and magnificence of nature. Our treks take you to the secluded, unspoiled places where few tourists venture – beautiful, remote, peaceful, and wild. Our style of walking is to take plenty of time to enjoy the birds, plants, animals, scenery and the fact of just being in the bush. We don’t race from A to B. That way, you can enjoy both the challenge and the beauty of the trail and surrounds – take a few photographs, sit down occasionally for a cup of tea, ask questions about what you’ve seen, or just be. 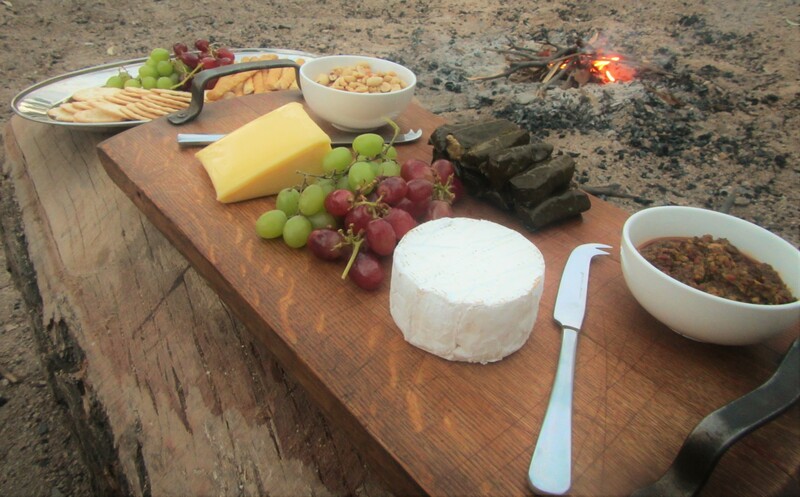 Trek Tours Australia prides itself on preparing fresh and wholesome meals using organic produce as much as possible. Our guides are skilled and passionate cooks who love to surprise and delight you with a tasty array of nutritious dishes. Anyone for coffee? The first meal of the day sets us up for a great walk. We love making a beautiful cup of coffee first thing in the morning, which we gently plunge for your pleasure. Tea drinkers find that our dozen or so tea varieties offer a cup to delight. Our guides are an eclectic bunch of beautiful people who love to share their wilderness experience and knowledge, creating inspiring trekking journeys for our treasured guests. While you’ve been out hiking the trail, your camp host has been busy preparing another scrumptious three course meal (sorry, no one on our treks loses weight :). Think gourmet cheeses, exotic dips, roasts, pastas, risottos, stir frys, grills, camp oven specials and fresh tasty salads. A surprising sweet finish is always a lovely way to end the day. Vegetarian and other dietary requirements are a speciality of ours. “From the moment our guides picked us up at our hotel to the time they dropped us off 6 days later their professionalism, experience, knowledge, personalities and exceptional cooking abilities made this trip 10/10. Having guides like this certainly puts the whole group at ease and our group in particular were great. “Now back in civilsation after an awesome 6 day experience with Trek Larapinta. Being an older trekker, I was once again overwhelmed by the care and support of the guides and the willingness for me to do as much as I could/wanted to do.Having done the Jatbula last year, I was keen to try the Larapinta. Once again the equipment, food and nurturing support of the guides was first class. The permanent camp site on the Ormiston River bed was stunning visually and efficient practically. 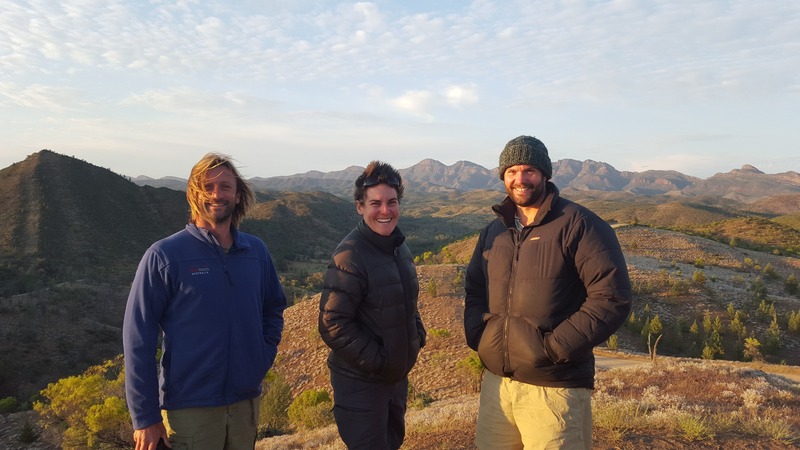 Well done, Trek Larapinta! Inspired by trips through the Kimberley and Kakadu, Clare decided to turn her love of the outdoors into her lifestyle. Studying a Certificate IV in Outdoor Recreation in Cairns, Clare spent several years working with school students on outdoor adventures and then 7 years ago began guiding with Trek Tours Australia. 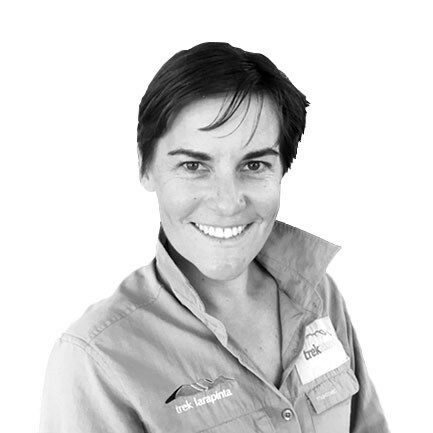 Her guiding career has taken her to the Larapinta Trail, Heysen Trail, Kangaroo Island, Jatbula Trail, Kakadu, Bungle Bungle & Tasmania. Clare then spent two years as our Guest Services Manager and in 2019 moved into the busy and exciting role of Australian Operations Manager. She is looking forward to the new challenge and spending time in all the amazing locations around Australia where we offer treks. General Manager Nick Scharm grew up exploring the landscapes and cultures of Africa and Europe. Travelling, exploration and trekking was imprinted from a young age. Nick moved to the mother country, Australia, to take up studies in ecotourism and landed his first guiding jobs in south east and far north Queensland. After trekking through the Tasmanian mountains, Nick fell in love with the island state and eventually made the permanent move to Launceston, which he now calls home with his small family. 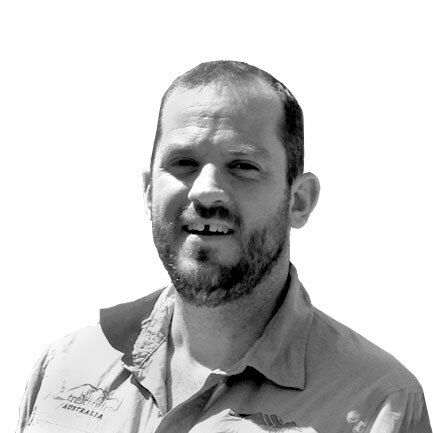 Nick has been in the tourism and trekking field for 20 years and holds a BA and MA in Ecotourism Development. Nick has filled senior guiding and management roles with a variety of national and international travel companies. Nick’s passion for delivering a genuine wilderness experience is underpinned with his personal ethos of “getting back to nature where things matter”. Managing Director of Trek Tours Australia, Holger was born in Germany and was lucky enough to move to Tasmania with his family at the age of 2. Growing up in the beautiful Tamar Valley, North of Launceston he was introduced to the Tassie wilderness at a very early age. The Tassie wilderness is a place he feels very strongly about and is where this modern day bushman really feels at home. His passion and knowledge about the wild areas of Australia has seen him become one of the most trusted and respected wilderness guides in Australia. Having spent the past 15 years leading trips in wilderness areas in Tasmania, Northern Territory and South Australia he has built an impressive portfolio of treks and a legion of satisfied trekking clients (with an impressive television career featuring on Channel 9’s Getaway 3 times, Japanese wildlife documentaries and numerous local TV productions). Holger specialises in our remote walking trips in the Northern Territory, Tasmania and South Australia. 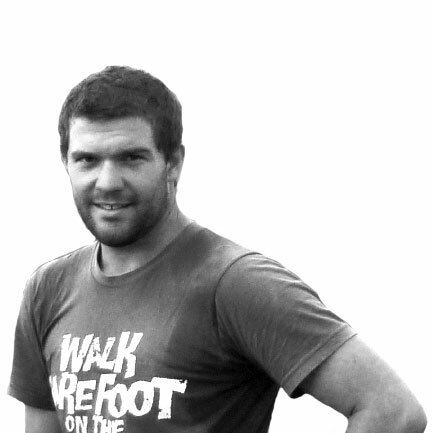 With unsurpassed local knowledge coupled with a Certificate IV in Eco Adventure Tourism and remote wilderness first aid qualifications, Holger is an outstanding professional wilderness guide, with a passion and commitment to customer service that is truly world class.